StP Quend Plage sud, K.V.A D2. HQ of Stab II./H.K.A.R. 1245 after April 1944. R600b emplacement for a 5cm KwK Pak gun. 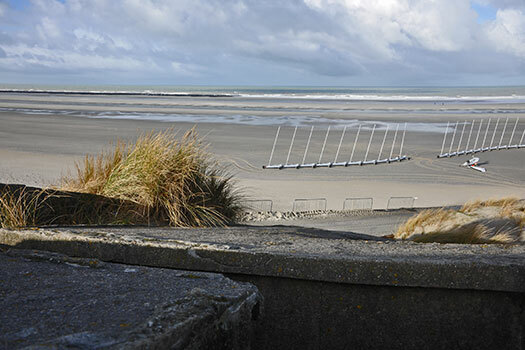 Walking along the beach in a southerly direction and you are at StP Quend Plage sud. 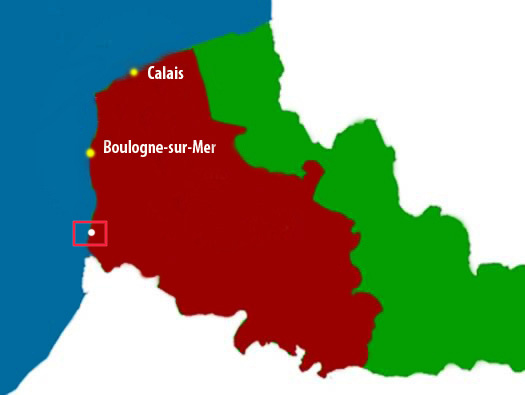 From here to the R636 is the StP defence, most if not all has gone either under the sand, taken by the sea or due to later development of the town of Quend Plage. R636 Fire Command Post for Army Coastal Batterie. R636 Fire Command Post for Army Coastal Batteries. A range-finder would have been set up on the open space on the roof. You can see the open space accessible from steps at the back. This shows how it has sunk into the sand through erosion, this must have been a real problem for the fortress builder, Todt, RAD or a local French contractor. Organisation Todt, a private German company used to build most German defences. Reichsarbeitsdienst men under age for the armed service were used to help the building industry and were trained on the military principals. Rear entrance and close combat window and access to the range-finder on the roof. There would have been steel steps set into the concrete. Fire Command Post for Army Coastal Batteries. Close up of where the ring would have been set into the concrete allowing the machine gun to move around. Rest for a machine gun would fit onto the metal ring. Allied drawing of a Tobruk. No idea what this was for?? on the floor. The niche had a voice pipe so the gunner could talk to the men inside the bunker. Voice pipe set into the base of the Tobruk's ring. A range finder would sit in the recess on the roof to line up with the target and work out the range, then send it downstairs to the computing room and then on to the guns. The original command post was inland at Colline de Beaumont but around April 1944 when this bunker was finished they moved here. 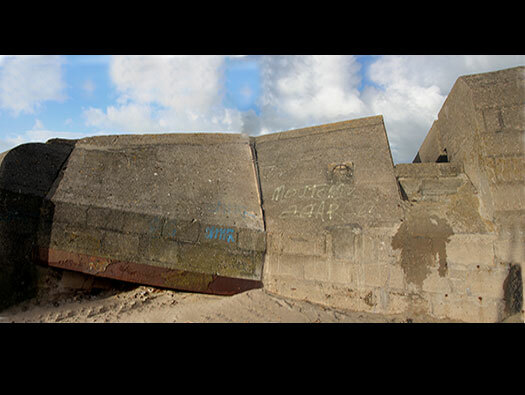 Their job to control several 17cm K18 gun batteries inland to shoot on any allied craft trying to land soldiers on the beach. The view towards the sea. Somewhere here was an R612 casemate with a 7.5cm Field Kannon protecting the flank. Radio aerial tube. The aerials were telescopic an wound up by a handle and pulleys. 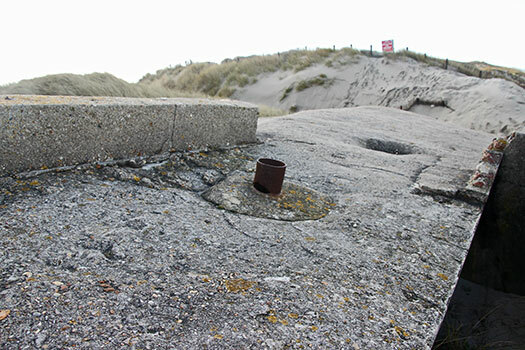 A 5cm KwK Pak L/60 gun was possibly situated up the beach in its emplacement. The L/60 has a muzzle break on the barrel. An R600b open emplacement for the 5cm KwK gun was fitted into it.